Home. That’s what students and alumni tell us BGSU feels like to them. Our campuses offer the benefits of a major university, with the personal, teaching-centered feel of a small college. A place where students can Belong. 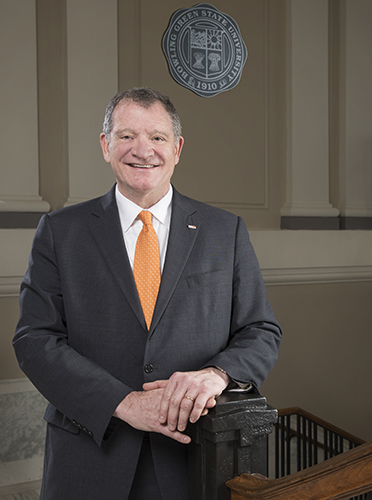 I am honored to have this opportunity to serve BGSU, my alma mater, as President. I am extremely proud of what we have to offer our students at both the undergraduate and graduate levels. And the work of our outstanding faculty never ceases to amaze me; their commitment to our students and their research is inspiring. We are all committed to providing a unique BG Experience, which starts with your first visit to campus. Caring faculty, personalized career planning and opportunities to lead – while serving others – means you can Stand Out from the crowd. In fact, BGSU is a No. 1 public university for student engagement, according to The Wall Street Journal and Times Higher Education. From our facilities, which include next-generation teaching and learning spaces, to our unique program offerings, you’ll find a unique balance of individual learning and world-class resources that prepare you to compete and succeed after graduation. The Falcon Internship Guarantee, for example, ensures all BGSU students have the opportunity to participate in an internship/co-op or other experiential learning activity. And with that experience, our graduates are prepared to Go Far, engaged in fulfilling careers and leadership in a global society. According to a national ranking by The Economist, BGSU is first among public universities in Ohio for boosting the earnings of our graduates 10 years after college. Our rankings, including being named as the most affordable of Ohio’s top-ranked colleges by Business Insider and our status as U.S. News & World Report tier-one national university, are only part of our story. At Bowling Green State University, you can Belong, Stand Out and Go Far! Explore our website to learn more. And I invite you to tour our campuses, where I know you’ll feel at home.